The sticker-shock-shrieking of thousands of Flash readers when they saw the two cent price increase on the previous issue must have created a huge disturbance in the Force because on the inside of the cover of #126 there was a letter from the editors with a detailed primer on Inflation 101 and how it affects you, Bunky. It was a pretty good explanation of why they had to stick it to us during which they pointed out that their competitors had already begun charging fifteen cents for their books. They finish by telling us that their Giant Annuals would still be priced at twenty-five cents which, when you consider the fact that they were pretty much all reprint books at that time, was a pretty disingenuous boast on their part. Hey, we were twelve, not stupid. Economics aside, the issue featured the return of the Mirror Master with some tasty Infantino/Anderson art on the cover. I remember it arriving just as we were starting Thanksgiving break which added a nice vibe to the issue for me. The A story revolves around the fact that the Mirror Master has discovered a way to enter a fourth dimension world through a mirror. In our real world, speculation about extra dimensions was still on the fringes of cosmological thinking and I always imagined John Broome paging through issues of Scientific American looking for plausible springboards. In any event, it worked for me. In this other dimension, MM finds himself the only male in a matriarchal society (he was literally the only male which raises some interesting questions all on its own). The women are about to dispatch MM when they see he has a mirror, something they had never seen. They love seeing themselves in the mirror so much (I can almost hear Gloria Steinem spinning in her spin class) that they instead to treat him to a pampered lifestyle catering to his every whim if he’ll promise to make a mirror for each of them. Anything he wants to steal, they simply provide for him. 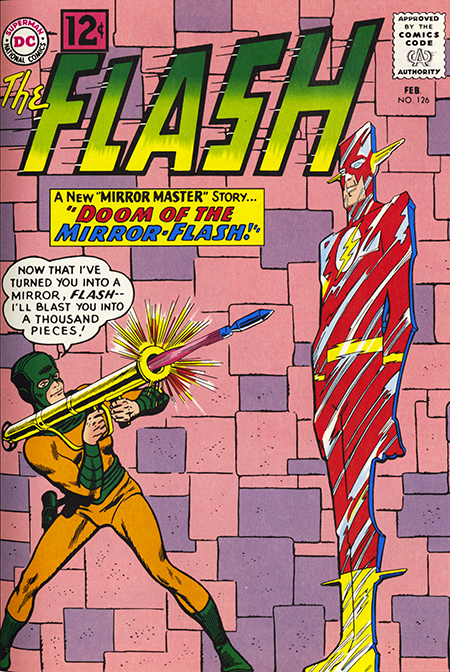 Like a thoughtful-examination-of-human-nature Twilight Zone episode, MM gets bored and slips back into our D to commits crimes where he is eventually is corralled by the Flash, but not before turning the Flash into a mirror and firing a bazooka at him. The Flash manages to escape thus saving MM from seven years of bad luck. The nice touch is the B story where all of this happens while Barry is supposedly in the green room waiting for Iris to wrap up a TV appearance. Given all of that, you would have thought it was my favorite story in the book, but the second story, Snare of the Headline Huntress, struck a deeper chord with me. It involved Barry returning to his hometown of Fallville where he encounters a childhood crush, Daphne Dean, who is now a Hollywood actress. Realizing that Daphne and Barry had been childhood sweethearts, her press agent tries to cook up a phony romance and engagement between the two for publicity and gets Daphne (with reservations on her part) to play along. Daphne gets kidnapped, the Flash saves her, the press agent gets a story, and Barry an Daphne part company as they both head back to their respective lives. The story ends with Daphne alone in her hotel room realizing that, even though she was play-acting initially, she really was still in love with Barry. And I was in love with that story. The real tangle of human emotions and behavior was somehow far more fascinating to me than the Mirror Master trying to blow up a mirror Flash with a bazooka. What? Talk about a disturbance in the Force.